Get your healthy hair back! Balmain's Revitalizing Mask is a beautiful product to intensively repair damaged hair. Give your hair the nutrition it craves. 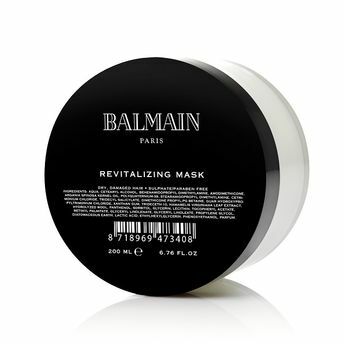 The Revitalizing Mask is enriched with the signature Balmain fragrance. The Revitalizing Line is enriched with the best quality ingredients to revitalize the hair from the inside. The revitalizing formula includes a fine selection of vitamins E, F and P. Vitamin E gives a boost to the hair and revitalizes the hair from within. Vitamin F keeps the scalp healthy, whereas vitamin P repairs dry and damaged hair, strengthens the hair fibers and nourishes the hair from the root. Due to the cashmere and silk ingredients in the luxurious revitalizing line, the hair feels smooth and silky soft. The ultimate ingredients for shiny, lustrous locks. Explore the entire range of Hair Creams & Masks available on Nykaa. Shop more Balmain Paris products here.You can browse through the complete world of Balmain Paris Hair Creams & Masks .